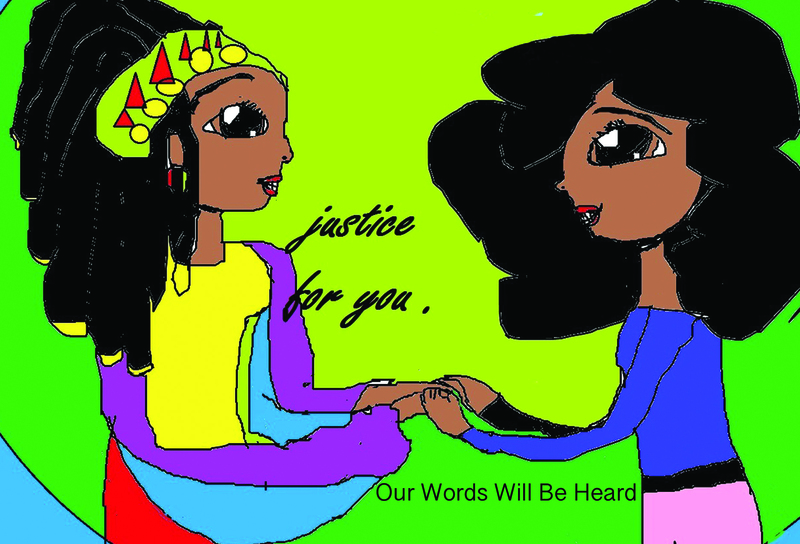 This exhibition, asked artists to create or submit pieces of artwork that express why speaking up and being heard is important, as well as sharing artists' own stories related to being silenced and rising up against that silencing. Hosted in partnership with Rising Up a pilot education program for middle school students. Portraits of People we Love is an exhibition that invited artists to create and submit work that depicts a person or persons each artist loves. This love may be platonic, familial, romantic, someone they only know in passing, but are overjoyed exist in the world, someone they have never met, but appreciate in the deepest, most meaningful way or any and all other forms of love. For images of the exhibition click here. This exhibition shares the experience of living with ceramics. The vibrancy and joy of a life surrounded by unique objects with history, stories, shared experience and the visible reminder of the ones who made them. For me this is my house, serving dinner on dishes made by people I love, this is my work, serving artists so that they can keep creating, this is my life, surrounded by incredible people doing incredible things. Summer 2016. What do artists do with broken pieces? Ceramic artists experience breakage every day. Mosaic artists use broken pieces to create. 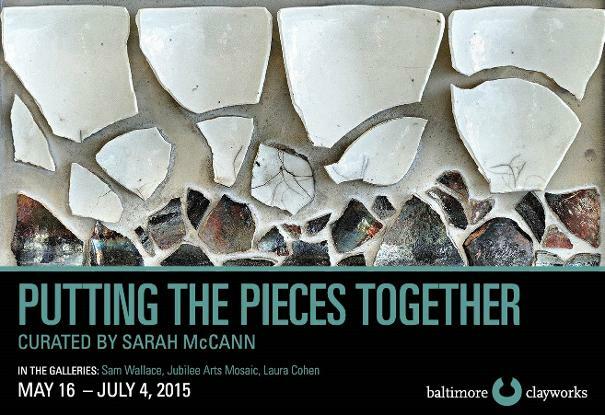 Putting the Pieces Together, curated by Sarah McCann, is an exhibition responding to the question asked of artists of all mediums: How do we put things back together when they break? Sometimes breakage is purposeful, like cracking an egg for breakfast. Sometimes it is unintentional like breaking someone's heart. Some things were broken through a violent history and after many generations still need to be healed. The cement and grout that is used to adhere broken pieces of tile, mirror and mixed media make beautiful objects that hold meaning not just as a whole, but in each piece used to create the image or sculpture they become. 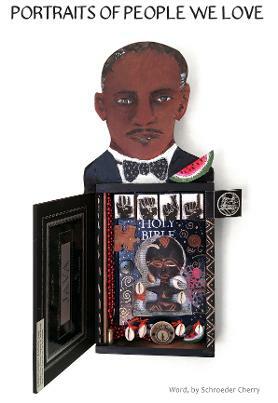 The artists that work in this art form weave together personal stories and larger narratives of the histories that we share. Work in this show will speak of things that are broken and illustrate how we as individuals and a community work to put the pieces back together. Experience Transformation showcases a cross-section of the clay community's different aesthetic sensibilities. From sculptural to functional work, this exhibition spans a wide variety of ceramic arts and generations of artists. 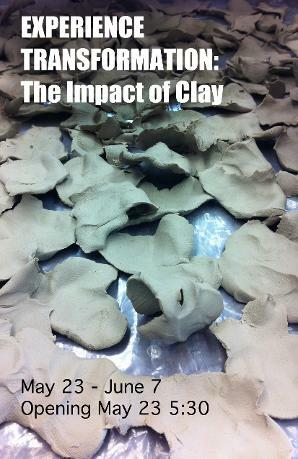 Clay as a medium embodies joy, transformation, the possibility of rebuilding, creating, and being human. The Many ways that artists connect both to the medium and to each other are visible in the work included in this exhibition. Baltimore Clayworks prides itself on providing a place for artists of all backgrounds to create in clay. This exhibition exemplifies the many ways artists create unique objects from one of the world's most basic mediums. Clay is accessible -- all one needs is the will to work. Touching clay can have the same impact on an experienced ceramic artist or someone who has picked up a piece of clay for the first time. Our hands leave an impression in the clay and on us, making the force of our existence visible. Join us for this fun collaboration between Baltimore Clayworks and the Creative Alliance to experience the wonderful world of clay and all of its diverse transformations. An exhibition featuring nine interconnected artists in collaboration with two dancers and young artists and dancers from ConneXions School for the Arts. In this exhibition each artist chosen to participate was a part of selecting the other artists. The task, invite an artist that you are connected to, but also different from. The exhibition grew organically from there to include artists of many backgrounds and various mediums including painting, digital media, sound, ceramic, printmaking, mixed media, performance and more. Special thanks to D center Baltimore for hosting and to all the organizations and individuals that helped to make it happen. CLICK HERE FOR MORE INFORMATION ABOUT ARTISTS AND EXHIBITION. What makes women awesome? Who are the amazing women you know? How have they impacted your life and work? What effect have they had on the world? Women: An Exhibition invites participating artists and designers of all genders to create work that celebrates the incredible women they have known, loved, and been influenced by. It is a chance to recognize and pay homage to all that the women in our lives have contributed to us. By showcasing the work of female artists and designers, exhibiting work about women’s roles in industry, and including projects about women known personally (colleagues, family, friends, mentors, role models, etc. 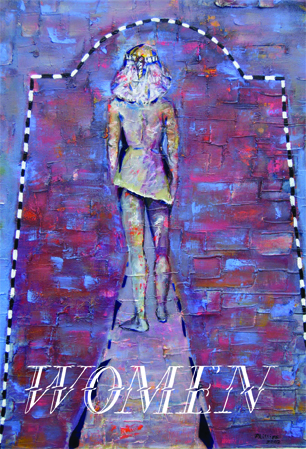 ), this show celebrates all the facets and roles of women in our lives. Curated by Sarah McCann, Women includes work by 39 artists from across the nation, 27 of whom work in Maryland (as well as one local Baltimore community organization) and 11 who hail from Colorado, Kentucky, Minnesota, New York, Pennsylvania, and Utah. D center @ MAP is hosting the exhibition from March 3 through April 14, 2012. Peace is a process, not an end goal. It is something we must work toward, strive for, and can only be approached though disciplined practice, awareness, and work. 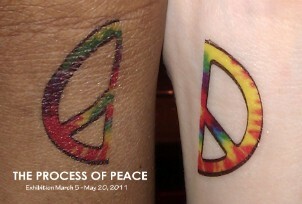 We each undertake very personal approaches to moving toward peace in our lives. This exhibition asks participating artists to create artwork that visualize their personal process of peace, what they do to maintain an active movement toward peace, and how this relates to their creative endeavors. 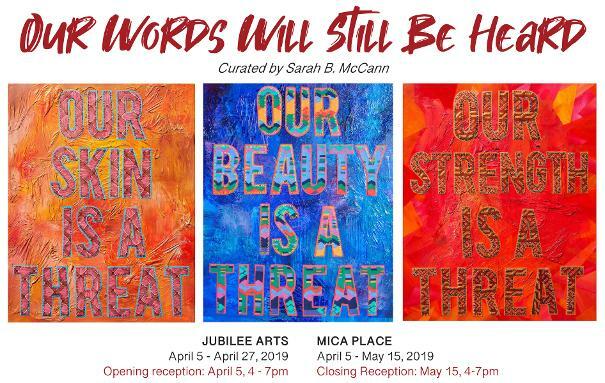 Curated by Sarah McCann this exhibition includes work by 27 artists from across the nation, 19 working in Maryland and 8 others from Arizona, California, Colorado, Massachusetts, Minnesota, Nebraska, New Jersey and Texas. 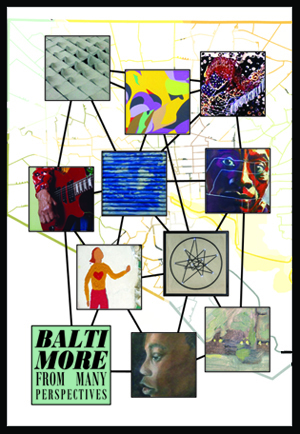 Towson ARTS Collective in partnership with Baltimore Green Works hosted the exhibition from March 5 – May 20, 2011. We live in a country where we are in a constant state of war against something. There is the “War on Drugs”, the “War on Terror”, the war in Iraq, and the war in Afghanistan. Each president seems to have their own personal war, which is presented in the press as something universal that we as citizens of the United States are all opposed to. What if one doesn’t believe in the war on drugs, the war on terror or the wars in Iraq and Afghanistan? These wars as presented are not universal at all, but rather very personal. If we each, as individuals, had the power to declare war, what would these wars be against? 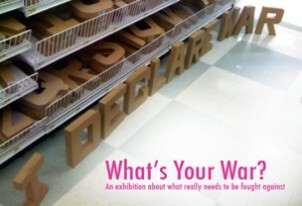 This question was posed to participating artists in the exhibition, What’s Your War? Curated by Oasa DuVerney and Sarah McCann the exhibition includes works by over 20 artists from New York, Baltimore, Tennessee, and Arizona. The exhibition was held at Load of Fun Gallery in Baltimore July 23rd - August, 2010. Special thanks to Load of Fun for sponsoring this exhibition! 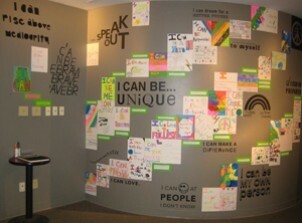 Facilitated by Sarah McCann with the Youth Dreamers in collaboration with students from MICA's graphic design program. This project addresses what governs the way we act in society. Laws dictate certain actions, but we all have a personal set of standards that direct how we relate to the world around us. Sarah McCann worked with middle and high school students to create and hang signs that read, "It is not ok to..." in a row of vacant storefronts in downtown Baltimore. The signs were deemed inappropriate for the business district and were taken down, but not before they received media attention. Other exhibition opportunities were found, like the Who Are You? Youth Media Festival. "It is not ok" was all about standards and putting limits on one's actions, so to add balance to the project students created "I can" posters. In collaboration with students from Maryland Institute College of Art, Youth Dreamers finalized new posters that state their potential and possibilities.